"A simple, honest message of recovery from addiction rings true." You're in a meeting. The sharing has been going on for some time. One or two members have described their spiritual experiences in an especially meaningful way. Another has had us all rolling in the aisles with entertaining stories. And then the leader calls on you... gulp. You shyly introduce yourself, apologetically stammer out a few lines, thank everyone for listening, and sit out the rest of the meeting in embarrassed silence. Sound familiar? Well, you're not alone. We've all had times when we've felt that what we had to share wasn't spiritual enough, wasn't entertaining enough, wasn't something enough. But sharing is not a competitive sport. The meat of our meetings is identification and experience, something all of us have in abundance. When we share from our hearts the truth of our experience, other addicts feel they can trust us because they know we're just like them. When we simply share what's been effective in our lives, we can be sure that our message will be helpful to others. Our sharing doesn't have to be either fancy or funny to ring true. Every addict working an honest program that brings meaningful recovery has something of immense value to share, something no one else can give: his or her own experience. Just for today: I have something valuable to share. I shall attend a meeting today and share my experience in recovery from addiction. Talking about sharing, there's one thing that made me sad. I don't usually expect anything when I shared something, but does it made you feel difficult to say a simple thank you? I've joined a local forum as a regular member mainly to help my colleague things about Blog*Spot. Furthermore, I believed when the old wise men said, "Sharing is Caring." Then I realized, after all these while I seldom received a thank you note. Let alone to reply to a comment or two that I left on their blogs! I can still remembered the first time I saw this template. It was on Eches's blog. And I was quite excited about it too. You see, I had a friend named Eches too. I knew him when I was still new to blogging. I had a little bit of trouble with a zipped file and I emailed him asking for help. That was the beginning of our friendship. As a courtesy, I dropped a comment or two on his blog thanking him for being a friend, telling him how proud I was to him as the creator of a magnificent template and many many more. But I guess I got the wrong person because I've yet to receive any reply from him. My bad! I should have check about it first, not jumping to conclusion just because the other fellow had the same name! Yikes, it' such an embarrassing situation, claiming an unknown person as my friend! Sorry about that. Here is a list of persons and things that has helped me to convert O2 to the present state. I'm sorry if your names were not listed. There must be severals reason why it was not listed. Mainly, it might be I'm getting old. I tend to forget things easily. Plantilla Blogy - O2. Created by Eches for Wordpress. 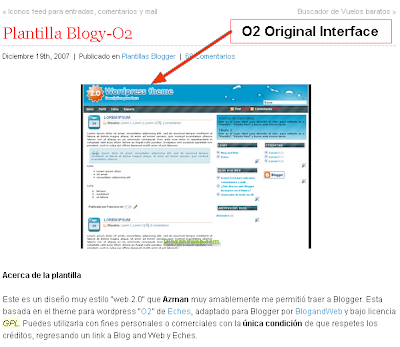 Created for Blogger compatibility by Francisco. Banner - I used my favourite photo editor, ACDSee. Search Box - Changed it to Google Search. At least it will add something to my AdSense's coffer. The Rest - A simple CSS and HTML tweak. How do you like it? Need any changes on your template? Just leave some comments or shoot me an email. I shall get to you, pronto! Now like Lynn Anderson (remember her?) used to sing, "I never promised you a rose garden", at least there will be some changes on your template, if you will just let me. Before I leave you to dwell on what you gonna do with your template, here's an interesting reading material brought to you exclusively by The News Room. It got some thing to do with "Civility Online." See you soon. Greetings and lots of love from Malaysia. Sharing our experience to other's gives them something to learn. We serve to be an example.We don't embarrass ourselves by this,but it's one way of giving light, warning or inspiration to each and one of us. Anyway, I'm really looking for blogger templates.The problemm, is that I don't have Winzip.It's not a free software right..
me? Comment it at my blog. By the way can we exchange link? i looooove the new look. and i'm so happy you're happy. lotsa love to you my friend! Hi ArahMan! I've missed you. I LOVE the new look! It makes the blog look wider, bigger, more clear.